University of Montana head football coach Bobby Hauck at a press conference at UM, Dec. 1, 2017. The University of Montana’s new president and football coach will participate in a forum on sexism, sexual assault and cyber-bullying surrounding college athletics on campus next week in Missoula. Monday’s panel discussion is hosted by local human rights group Missoula Rises. Erin Erickson is the group’s founder and director. Erickson says "it started with a petition by a woman named Lisa Davey. 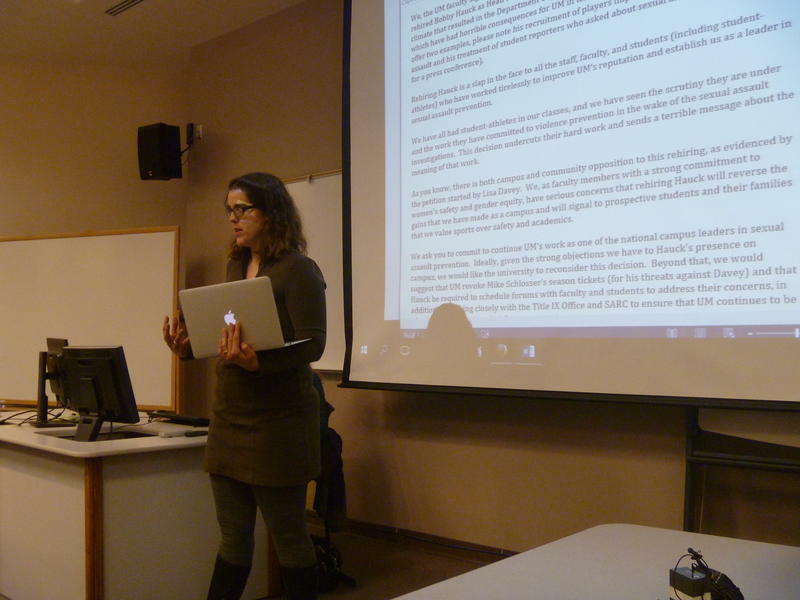 That petition was not done through Missoula Rises; she started that petition individually. 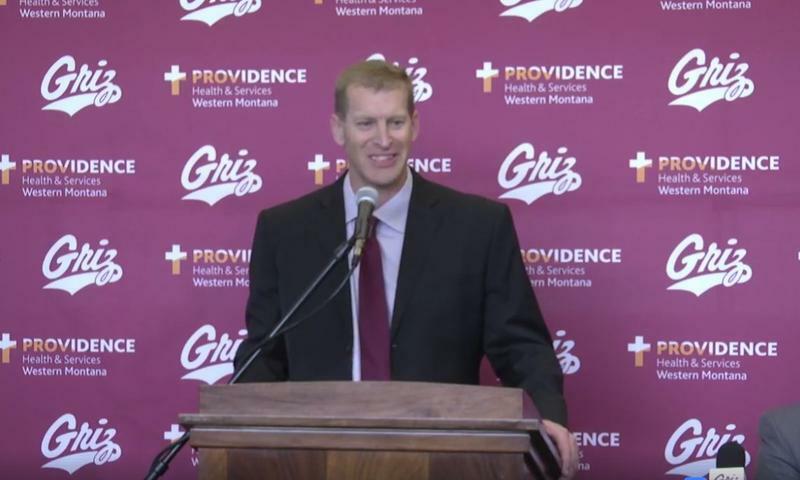 It arose with talk of the University of Montana rehiring Bobby Hauck as the head coach." Hauck’s rehiring late last year drew divisive reaction. Hauck posted an 80 and 17 record during his first go-round with the Grizzlies from 2003 to 2009. His return thrilled some fans who are hungry to get back to the team’s glory days. But critics, like season ticket holder and UM alum Lisa Davey, say Hauck’s recruiting decisions led to big problems. 12 Grizzly players pleaded guilty or no contest to a variety of crimes when Hauck first coached at UM. Davey circulated a petition to UM to not rehire Hauck that generated several hundred signatures. It also led to a vicious backlash against her on some online fan forums, including personal insults and threats of violence. The university condemned those actions. Erin Erickson of Missoula Rises says UM should be commended for willingly participating in Monday’s forum. Athletic Director Kent Haslam will join President Bodnar and Coach Hauck on the panel. "The point of this forum," says Erickson, "is to have the conversation with the university; to get the facts out on the table, to understand what the university is doing, to listen to Coach Hauck to hear how his style may have changed – or not – and to hear his opinions and thoughts on these issues. We want a community conversation about it so we can hopefully generate ideas together on how we can move forward in a positive way." Monday’s "Tackling Sexism: A Community Discussion with University of Montana" forum runs from 7:00 to 8:30 at Missoula’s Wilma Theater. Several University of Montana faculty members who sent a letter criticizing the rehiring of Bobby Hauck as head football coach received an angry email today from an athletic department employee who was not authorized to speak for the department. 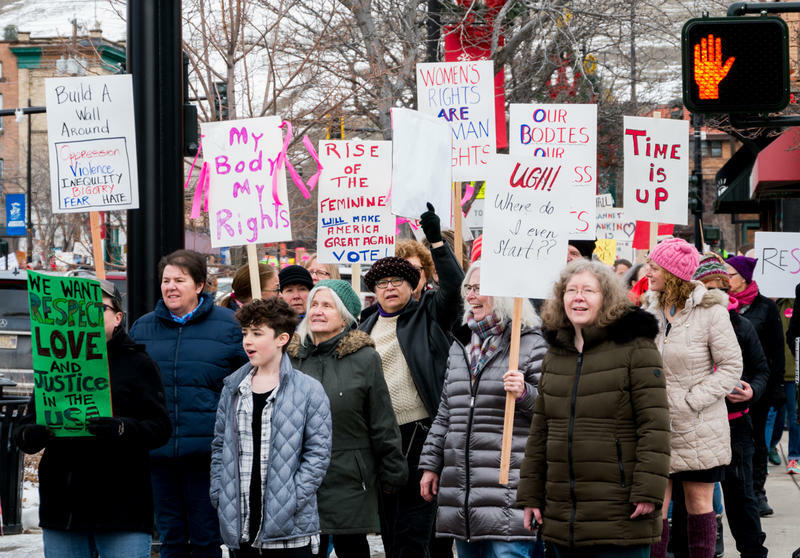 In Missoula, pink hats, red sashes, and sassy signs peppered downtown Saturday morning, as an estimated 3,000 people gathered for the second Women’s March. Last year, a centralized march held at the state capitol drew an estimated 10,000 people. But this year, 9 cities hosted coordinated rallies. The University of Montana has its new head football coach. As widely speculated, UM went back to the future with its selection.